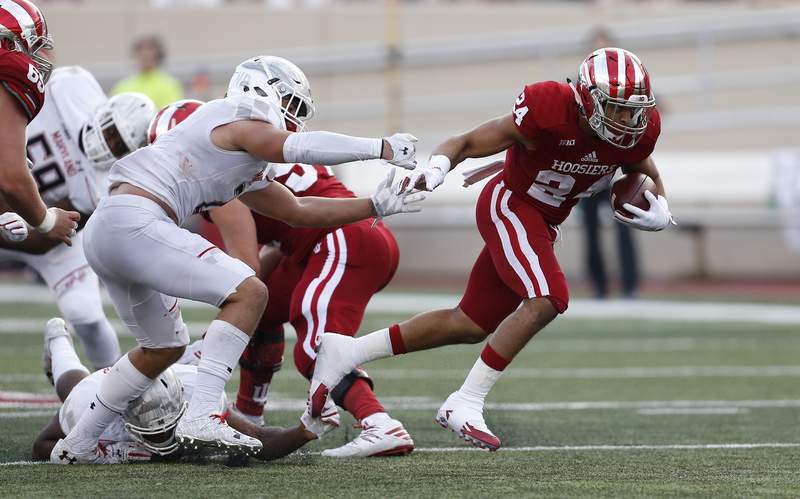 Associated Press Mike Majette is one of three running backs who should see significant playing time this season for Indiana. BLOOMINGTON – Season No. 134 of Indiana football kicks off tonight as the Hoosiers travel to Miami to take on Florida International. This is the second time IU has begun its season against the Golden Panthers, the first coming in 2016, when Indiana earned a 34-13 win. For the Hoosiers, it will be the first start for redshirt sophomore quarterback Peyton Ramsey since he was sidelined with a knee injury in a Week 9 matchup against Maryland last season. Further, with 11 starters returning on offense, today's tilt will be fans' first look at what should be a vastly improved unit. Defensively, the Hoosiers return just four starters. But with experienced pieces at linebacker and defensive line, Indiana stands to maintain the upward defensive trajectory it has gained under Allen. Indiana's secondary, headlined by senior Jonathan Crawford, junior A'Shon Riggins and redshirt sophomore Marcelino Ball, will also be on display. The Golden Panthers face the tall task of replacing Alec McGough, the most prolific passer in program history. McGough, who was drafted in the seventh round by the Seattle Seahawks, is the school's all-time leader in pass attempts and touchdowns. FIU has said both Christian Alexander and James Morgan will play at quarterback. Morgan, a graduate transfer from Bowling Green, was named to the Johnny Unitas Golden Arm Watch List this preseason. Alexander, a dual-threat who has more ability to run than Morgan, took the first-team snaps during training camp while Morgan finished his degree. Where this game should be decided is up front. FIU lost seven of its top nine tacklers from last year's 8-5 team. Fifth-year senior Anthony Johnson and senior Fermin Silva anchor the defensive line. Both have extensive experience having played 34 and 28 games, respectively. They'll be tasked with keeping IU's three-headed running attack of Cole Gest, Mike Majette and Ricky Brookins at bay. Tayland Humphrey, a 6-foot-5, 350 pound 4-star JUCO transfer, will also chew up would-be blockers in the middle for the Golden Panthers. Junior cornerback Isaiah Brown, who has clocked a 4.4 second 40-yard dash, is another player to watch for FIU as he comes back after a broken left collarbone against Middle Tennessee State ended his year after just five games. The Hoosiers have won 12 of their most recent 14 season openers and 11 of their last 12 nonconference games.